Well, if you’re like the majority of patients, probably not. Research by Dr. Edward Miller, dean of the medical school and CEO of the hospital at Johns Hopkins University, found that nine out of 10 bypass patients don’t make the necessary lifestyle changes to reduce the chances of a next event. If 90% of people don’t change when faced with a life-threatening situation, imagine how many people don’t change for smaller, less important things. And if it’s so hard to get one person to change, imagine how hard it can be to get a group to change. Now think about how hard it is to change an entire organization, made up of people with different agendas, different mindsets, different ideas. If you’ve ever been responsible for leading change in an organization, you don’t need to imagine it—you know how hard it is. To understand how to facilitate change, you first have to understand how our minds react to change. Change, no matter how important or inevitable, is frequently viewed as negative. Because it’s uncomfortable to change the status quo, change is fiercely resisted. Positive, creative change requires a mindset for change. A mindset is the way we see things, the way we think about the world. The brain is designed to lock into these patterns and systems, so that even if we have a desire to change, we don’t. 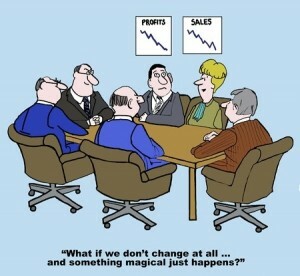 Because of this, giving someone a whole lot of facts about why they should change doesn’t make change happen. If the fact doesn’t fit the current mindset, it gets rejected instantly. Organizations and even entire industries can get locked into their mindsets, to a point that they become self-reinforcing. No one questions the prevailing thinking, and any other view gets discounted or ignored. This is why radical change often comes from outside an industry or from those who bring a different mindset and dare to think differently. Try using what we know about mindsets and thinking to your advantage. What you’re really dealing with when managing change is managing the fear of change, and this fear can manifest itself in different ways, depending on the person’s thinking preferences. To get people on board with change, you have to be able to answer the questions and concerns that will matter most to them. 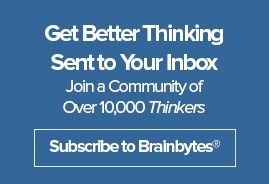 Our research shows that groups of almost any size represent a balance of thinking preferences, so your best bet is to take a Whole Brain® approach. By doing so, you can not only make change more comfortable for everyone, you can provide both the context and the detail to keep people from “filling in the blanks” and making assumptions about what the change really means. How are you going to get that “fresh clothes” approach to your next change initiative? 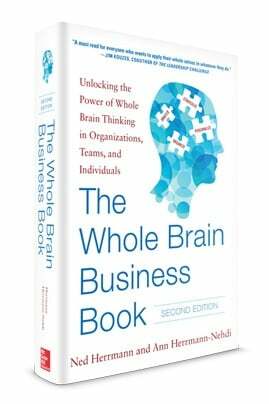 The Whole Brain Business Book, Second Edition includes a completely updated chapter on change, full of tips, checklists, charts and examples. Order your copy now.